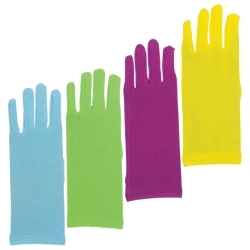 These colored dress gloves can be used to add color to almost any costume. They are perfect for Willy Wonka in "Charlie and the Chocolate Factory", residents of the Emerald City in "The Wizard of Oz" or for characters in "Seussical the Musical." The colored dress gloves are available in blue, green, purple, or yellow.